How was your Sunday? Did you have a good day? Looking at the forcast this week there doesn't appear to be even one night at or below freezing. Very odd indeed for New Hampshire. However, we're still getting in the Fall spirit! In honor of Char from Ramblins, who passed away unexpectedly, earlier this year, I've been wanting to photograph small white pumpkins. See the photo on the upper right side of my blog? I've always loved that photo and I told her so when she published it. There are many of us bloggers out there that really miss Char. She was such a smart woman with an incredible talent for finding the right words to put with her amazing photos. She was a no-holds-barred kind of lady who told it like she saw it. When Char passed away in early June she left a huge hold in the blog world. We miss you dear friend. Oh Instagram, you devil you! You're so addicting! The big thing now is to order your Instagram images on Postalpix and then trade them with your Instagram friends. I swear, there's always something new coming along! And now I'm off to bake an Apple pie. It's in my nature to bake at night, just like my mother always did. Does anyone else bake at night? 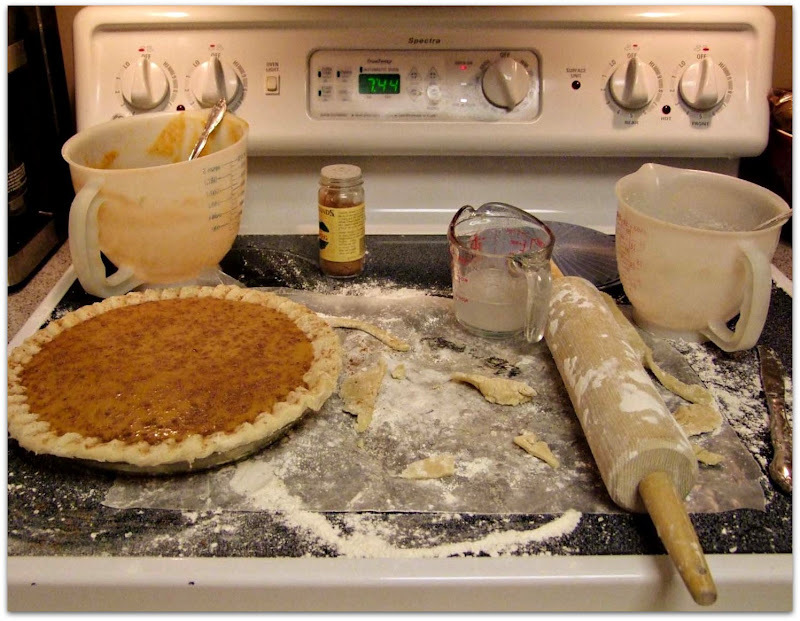 This is what it usually looks like just before the pie goes in the oven! 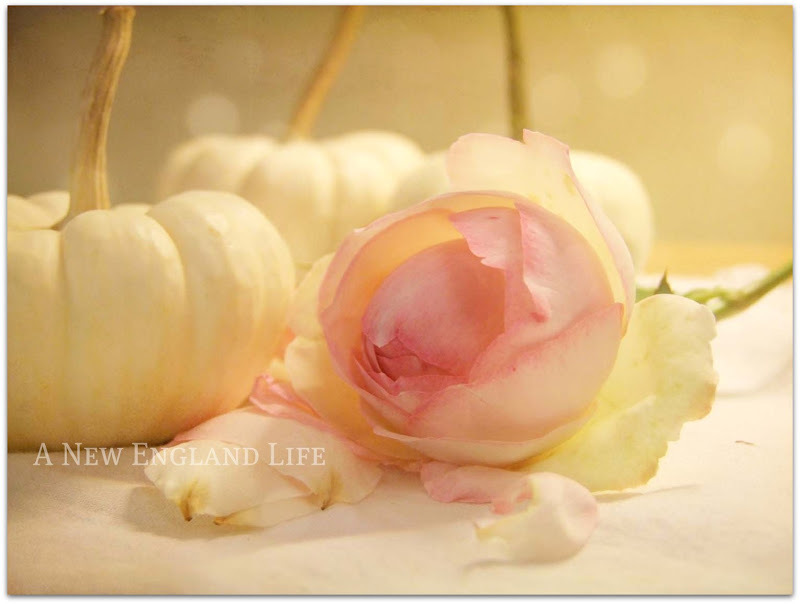 White pumpkins and soft pink roses - makes such a pretty combination. Beautiful photos. I have not baked anything from scratch in so long - Don't need the goodness sitting around where I will be tempted. :D Homemade apple pie sounds so good.Don't know if we will have much color this year or not - has been pretty dry lately. Such beautiful photo's they are aweinspiring. I didn't know Char, but all I can say is you have honoured her beautifully. Thank you for such beauty on a cold and stormy night in England. 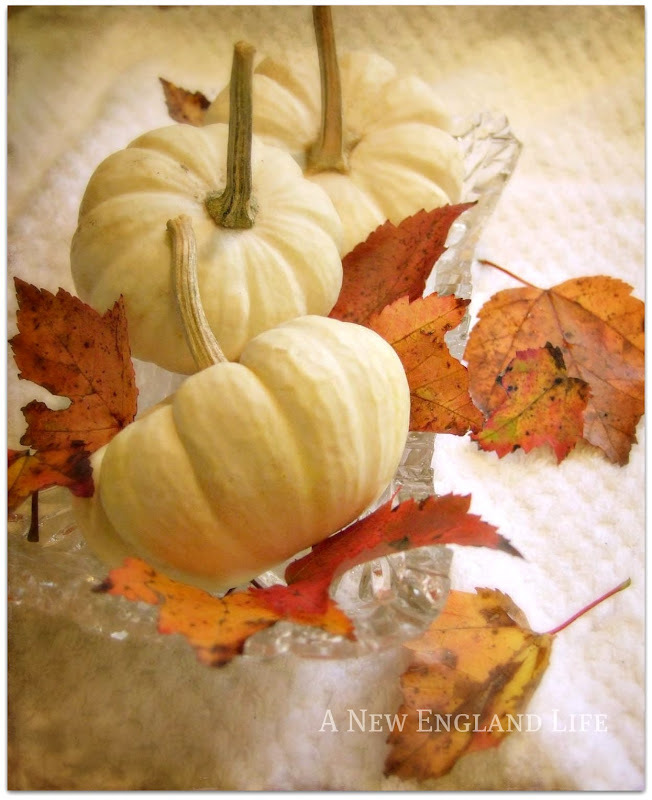 I had never seen white pumpkins! I am surprised we haven't run into each other in the blogging world before because Char was one of my favorite people in this world too. I still miss her and think of her often...she was an inspiration and mentor to me when I first became interested in photography and blogging. So many of her photos I adore and had immediately noticed the one you had on your sidebar...gorgeous! 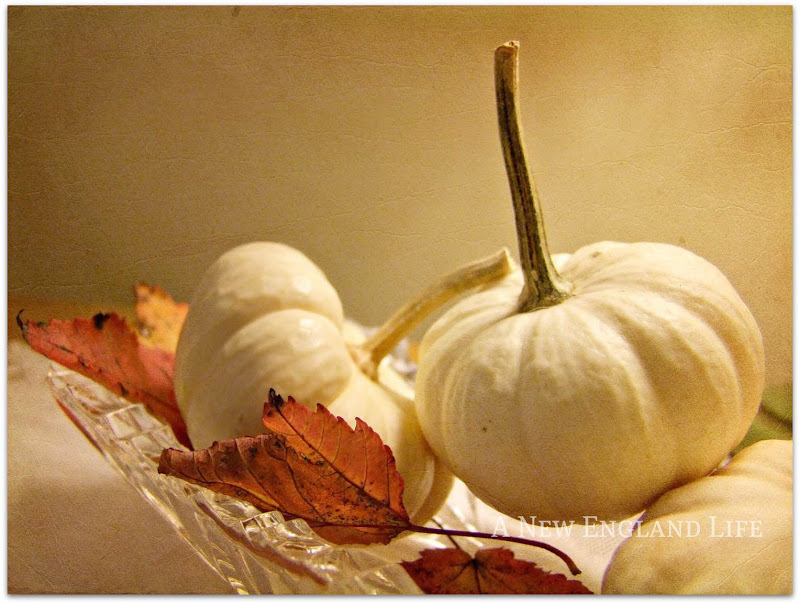 I love your white pumpkin photos...they are special! I am excited about sharing postalpix with you! Hi! So lovely colours, and that pai...yummy! How do you make it?! Lovely photos...I am always so impressed with your camera ability! I still miss Char, so. Since her passing I've had difficulty putting word to keys/screen - not sure what that's about. Kind of a block. Beautiful photos, Sharon. I can honestly say I've never made a pie on the oven before putting it in the oven. Not that there's anything wrong with that! Beautiful combination of flowers and white pumpkins. I really like your pictures. Thanks for sharing. I've never seen an apple pie made that way. looks good! Pumpkin pie is my all time favourite. I'm going to have to make some soon. After we move, maybe, to celebrate and fill our new home with yummy smells. ! 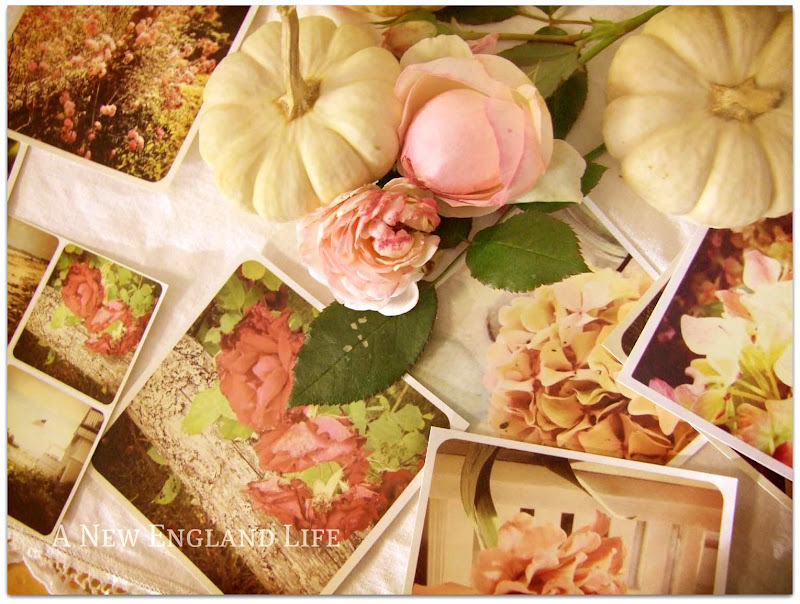 I love these images, Sharon, especially the pumpkins and rose petals. And your new header – honestly, your headers are the best! I well remember the one from the first time I visited here. Thanks again for the advice on Instagram. I downloaded all the apps tonight. Oh dear! I'll bet the pie was delicious! We are having Indian Summer here today, well, up until today when we are having light rain. Sharon, I love these pumpkin photos. I had been admiring that white pumpkin photo that belongs to your friend. It's lovely. There are so many new apps out there my mind is spinning. I will need to try out the Postalpix. Also, which frame did you use for for the 4th photo. I just love it. Night baking is the best. I don't know why I only bake late in the day, either. And I need to be on Instagram more. 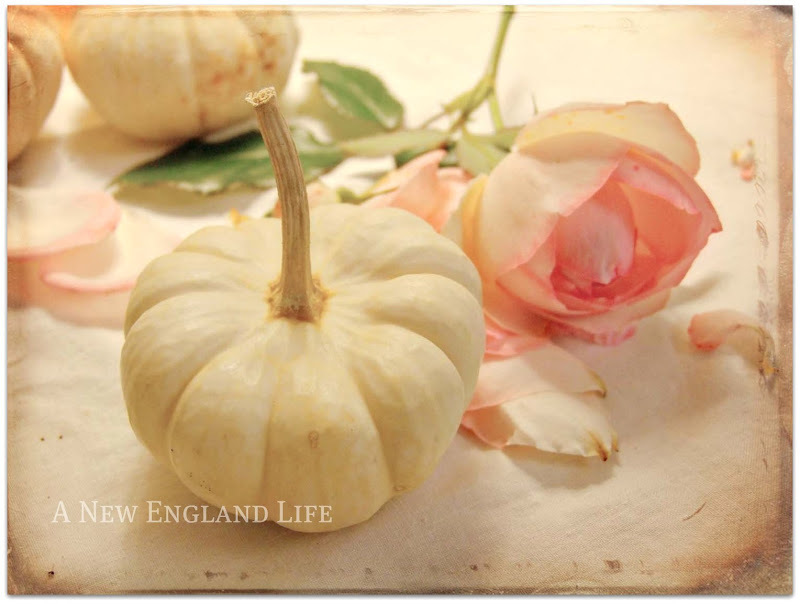 I really love the unique combination of small white pumpkins and pale pink roses. That's lovely! Beautifully captured flavours of the season, the colors are so artfully blended. Thanks for sharing. The pumpkins and roses look so pretty together!